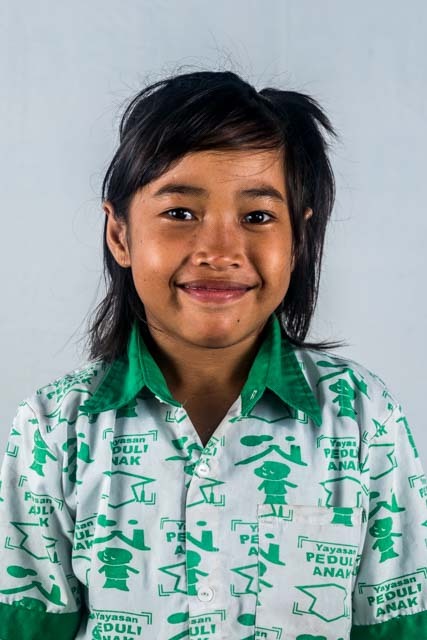 Mustika Juwita Sari, known as Tika, is an only child. She comes from a poor, broken home family. Her parents divorced before she was even born. Her mother left her to work overseas when Tika was two months old and never came back. Tika used to live with her aunt, who was also very poor. She never went to school. Aware of the circumstances, the Social Agency referred Tika to Peduli Anak. She is actually a cheerful girl and easily adjusted to her new environment. She participated in all the activities with a lot of enthusiasm. Tika likes playing with dolls, solving puzzles, drawing and swimming. She’s very happy to be studying at school. She wants to be a dentist when she’s older.